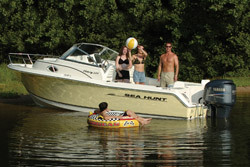 Class 2 boats is the next step up in the chain and typically an open skiff boat with the addition of a small cabin under the front deck - one that a person could standup in. The boat might have a head and Vee Birth. Windows on the side usually indicate the presence of a cabin. these boats range in length from 19; to 28' typically. 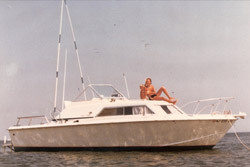 Outbards are more popular than inboards in this class of boat but not by much.